Embryo Freezing Under controlled conditions embryos are cooled and stored at extremely cold temperatures (-196oC) which suspends their development. 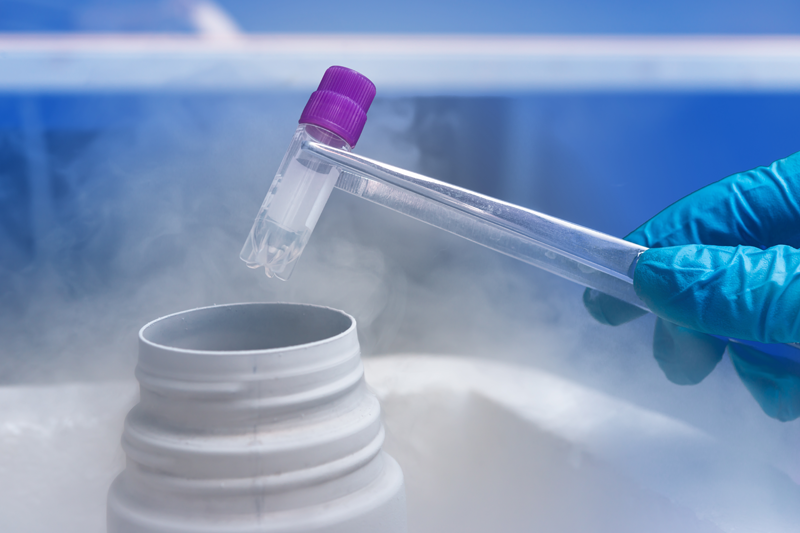 Once frozen, embryos can remain in liquid nitrogen for years before being thawed and used in treatment. Who can be helped by embryo freezing? IVF is much more successful if the ovaries are stimulated with drugs. These drugs enable the growth of multiple follicles within the ovaries resulting in the production of many oocytes (eggs) and usually many embryos. We transfer two to three embryos in the womb from two to three days following your egg collection and any good quality surplus embryos can be frozen and stored for the future.Occasionally it is advised to abandon the embryo transfer and to freeze the embryos for use in treatment at a later date. We suggest this if the drugs that we use to stimulate the ovaries have worked too well. If large number of follicles are seen on ultrasound scan this also means there is a risk that hormone levels circulating in the blood are too high. This can lead to Ovarian Hyper stimulation Syndrome, a condition dangerous to both mother and baby. Pregnancy worsens this condition and so it is better to postpone a fresh embryo transfer until the hormone levels subside. We may also advise embryo freezing if there is evidence of an endometrial abnormality, such as polyp. All of your embryos will be stored until it is safe to proceed with pregnancy.If you are about to undergo medical treatment that may render you infertile in the future, it is possible to freeze embryos before this treatment. This gives you chance of having children at later date. There are currently two methods for cryopreserving excess embryos. In order to succeed, any embryo cryopreservation strategy must minimize the impact of ice crystal formation, solution effects and osmotic shock. The traditional method is to slowly cool the embryos and the surrounding solution to the storage temperature with the deliberate intention of the formation of ice crystals remote from the embryo. Vitrification is the latest technique of cryopreserving embryos/blastocysts. Vitrification is different and by utilizing extremely rapid cooling, transforms the solution into a glass like amorphous solid that is free from any crystalline ice structure. Thus survival of embryos after thaw is definitely much higher.Both methods use special compounds known as cryoprotectants to avoid cell damage. Typically, during Vitrification, permeating cryoprotectants like ethylene glycol (EG),dimethylsulphoxide(DMSO) and glycerol are added at a high concentration while the cells temperature is controlled at predetermined level above the freezing point. Because of their potential toxicity at these concentrations the embryo cannot be kept at these temperatures for long. After very short time for equilibration the embryos are plunged directly into liquid nitrogen temperatures. A typical Vitrification process involves exposing the cell to three or more cryoprotectant solution in a multiple well dish, then the embryos are loaded on the special carriers/ devices called the fibre plugs and then plunged directly into liquid nitrogen for long term cold storage. The entire process is very quick and carried out on a special kit called the CVM Kit from Cryologic, Australia. This process of ultra rapid freezing is relatively new and needs lot of expertise and skilled embryologist to perform it. The embryos are removed from the liquid nitrogen storage and placed into a small quantity of pre-warmed washing solutions. These different solutions remove the antifreeze they were frozen in whilst gradually warming them to body temperature. This procedure takes 20minutes and then your embryos are placed in the culture media in the incubator and then transferred back to the uterus. How many embryos will be thawed? Embryos only start to grow again once they have been thawed but we know that not all embryos develop well. This means when we thaw embryos for your frozen embryo transfer we take out of storage more than you have consented to replace in the womb (unless you instruct us otherwise) We will continue thawing until we have 4 surviving, which will allow our embryologists to choose the best embryos for transfer, giving you the best possible chance of achieving pregnancy. Our embryologists will sometimes vary this if they feel more or less embryos need to be thawed. Of those embryos frozen at cleavage stage about two thirds (65%) will survive. You will be informed about the survival rate of your embryos before the transfer. Some times one or two cells within an embryo become damaged or die. As long as the rest of the embryo looks healthy we will culture them. Some of these embryos will continue to develop well and the damaged cells are not detrimental to pregnancy or baby. No obvious problems seem to have occurred among the many thousands of babies born throughout the world following embryo freezing. Babies born following embryo freezing appear no different from others. As with many assisted conception techniques, research is being conducted continuously and we cannot predict what this may reveal in future. When are the embryos placed in the womb? We suggest you use hormones to improve your womb lining. This is recommended if your cycles are irregular or unusual in some other way, and/or we have not managed to achieve an adequate womb lining naturally. When womb lining is ready to receive your embryos, when everything looks perfect, you will be given your appointment to have your embryos transferred and the embryologist will calculate the best time to thaw them. How successful is pregnancy using thaw embryos? Frozen embryos are slightly less likely to turn into pregnancies than fresh embryos but do give the opportunity for second treatment without the immediate need for another IVF cycle. How safe are my embryos in store? We take great care of the embryos in our storage banks and take all reasonable steps to avoid problems. The cryo devars are regularly inspected and filled with liquid nitrogen. We have completed the treatment successfully but still have embryos stored what will happen to them? You have several choices. You may wish to consider donating your embryos to another couple undergoing fertility treatment. You may consider donating your embryos to a project of research. You may extend the storage and would want to go in for another baby with your frozen embryos in future. You may decide to withdraw your consent to further storage of your embryos. Your embryos will then be removed from the storage and allowed to perish. We require your permission in writing before we can carry out your wishes.If you have any queries regarding embryo freezing please ask to speak with member of the embryology team who will be happy to answer your questions. Your nurse will also provide you with the necessary consent form and you should ensure that these are returned to the unit before any treatment is commenced.